On January 6, Italians celebrate not only the worldly-renowned Feast of the Epiphany, but also the very typical tradition of the “Befana”. As for most holidays here, this represents a perfect occasion to… eat! Especially candies. Because we know you love discovering new foreign food habits, we would like to share with you a quick and easy recipe to make your own pieces of coal. Yes, we said coal, sweet coal. No worries, we will explain everything. Please note: the quantity here is more than you will need for one coal candy. However, you can use the leftovers by only adding the colouring to two tablespoons of the mixture. Put the egg white in a bowl with some lemon juice. Whisk with an electric whisk and while doing so add the powdered sugar bit by bit and finally the alcohol and black food colouring. Whisk again making sure the icing is stiff and dark. Using a heavy based pot (not non-stick), add the baking sugar and water. The sugar needs to soak up the water, so turn on the heat and swirl the pan to make sure the water spreads evenly. Slowly, a brown caramel will form- the whole process should take around 10-15 minutes. When it is ready, add the black food coloring. Final step: The Coal Candy! Gently heat 2 tablespoons of the icing mixture in a bain marie then add this to your syrup mixture. Pour in a loaf tin covered with baking paper. It will rise so make sure the mold is high enough. If you like your candy with more air, leave the tin at this stage to cool at room temperature. If, however, you like it more stiff, use a spoon to quickly stir the mixture in the tin and then leave to set. Once the coal is hard, turn it out on to a chopping board and roughly chop it with a knife to obtain a coal effect. Cool, you have your handmade sweet coal. Now let me tell you why this is part of the Italian traditions. It is an ancient Italian tradition dating back to the 13th century, long before the arrival of Santa Claus. 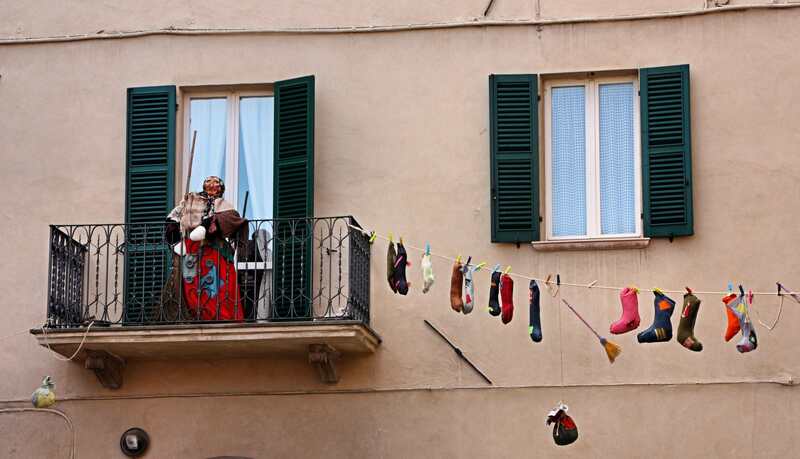 The Befana is closely linked to the Epiphany. Legend tells that the three Wise Men, on their way to meet the new-born Jesus, met an old woman with a broom and offered her to accompany them. As she was busy with housework, she refused in the first place. When she realised it was a huge mistake, she gathered a few presents and candies as a gift for the baby and tried to catch up with the Wise Men, with no success. From then, every year on January 6, the Befana wanders around the world in search of the baby Jesus while distributing gift and candies to well-behaved kids and pieces of coal to mischievous kids. Because she was old, poor and dressed in rags, she is now traditionally represented as a witch riding her magic broom. So this is the story and it doesn’t end nicely for all of the little monsters! In order not to be too harsh on them, it is customary to leave some coal-shaped candies in their socks. And you, will you experience this Italian tradition with our coal sweets recipe?